Just like the videos (here), this is going to be long and laborious. If you manage to make your way through this whole thing, pour yourself a nice bourbon. Personally, I am starting with the bourbon now, as I write this. I suspect, it will be a living document for a few days (so Scotch and Rum might be involved in some stages of this creative process). I liked the DocterSight III quite a bit, so I made sure I visit Docter Optics at SHOT. They are now owned by a company called Noblex. 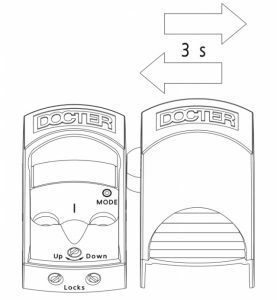 I am not sure what that means for Docter, but I hope that means more funding for R&D and increased marketing reach. 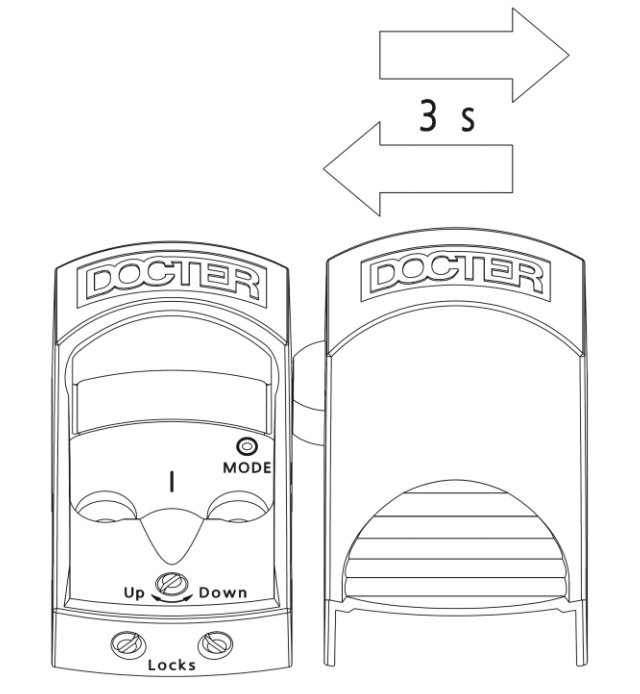 Docter is one of those German companies that I can never quite figure out like Kaps or Nickel. I know Docter has an arm that deals with the military side of things since I have run into theei US arm in the past. In the commercial world, Docter has a fairly complete line of hunting scope and a few offerings intended for some sort of competition use. I am not up to speed on the types of competitions that exist in Europe, but it sounds like a low range variable scope with a simple dot reticle and bright illumination is just the ticket for that. 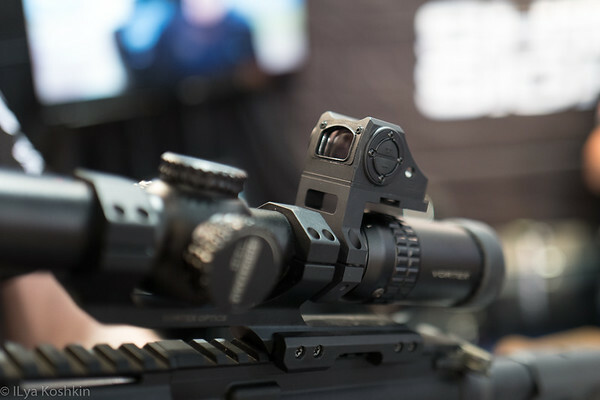 Aside from that, these all look like very solid scopes with the V6 line standing out to me as the more modern offerings that probably go head to head price-wise against Meopta’s MeoStar R2 line, the new Leupold VX-6HD and a few others. I honestly do not know where these sit quality wise, but they looked pretty good offhand, so I will make sure I look at one. I think the V6 2-12×50 will be an interesting design to mount on my 280Rem and test. It looks like it only comes with the #4 reticle which I happen to like, but the illumination system looks to be exceptionally well worked out. There are quite a few other magnified scopes in the Docter line-up (some come with intersting colors…), but I have to start somewhere and I think I will start with the V6. On the red dot sight, they have a couple of products that got my interest. The new DocterSight G is the next evolution of their miniature reflex sight, but with a much larger lens, so I expect it to be notably quicker to pick up. It will also have manual intensity adjustment. I expect it to land on our shores toward the end of the year and I will test it then. Quicksight, is on the other end of the spectrum: it is a freakishly small reflex sight intended for shotguns. It has a different construction which allows it to have a very low axis. The construction uses some sort of a prism to redirect the projected dot, so the LED can be set underneath the lens. That way the body you can see to the right of the lens is basically just a battery compartment. Vertically, the sight is extremely short and low profile. Looking it over, I did not see any means of adjusting POA, so I suspect that on shotguns, it clips to the top rib of the barrel and is considered to be more or less sighted in by design. I would like to test that theory. In short, I see some things at Docter that are very traditional and some are pretty innovative. 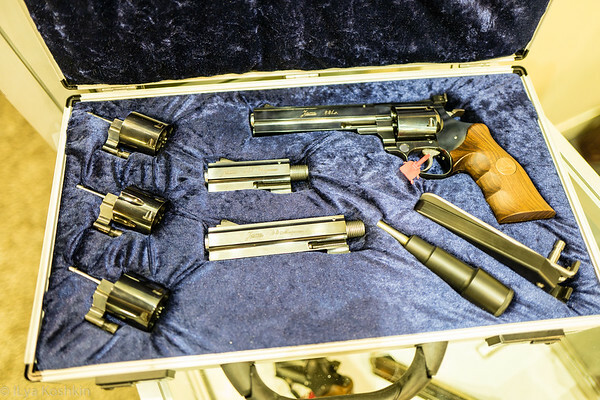 They were right next to Docter and the revolver there looked very cool with interchangeable barrels, cylinders, etc. Once I learned that these start at around $6k, I walked away, but not before taking a couple of pictures. 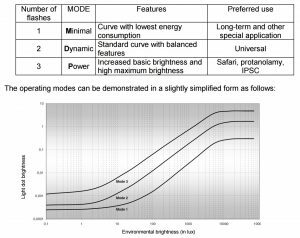 EOTech had some reasonably well publicised issues involving their holographic sights which tarnished both the company and product in many ways. Beyond this acknowledgement, I will pretty much ignore all of that sordid history and focus on the new products. New products in question are Vudu riflescopes. Finally, EOTech offers a line of proper magnified sights and they seem to be pretty decent magnified sights. What I am not entirely sure of, is whether they are sufficiently differentiated from everybody else on the market who uses LOW’s OEM designs. What I do not know is whether EOTech has made any modification to these LOW designs outside of their own reticles and external cosmetics. The EOTech person I talked to said there was some additional customization, but I do not have an easy way to verify that. 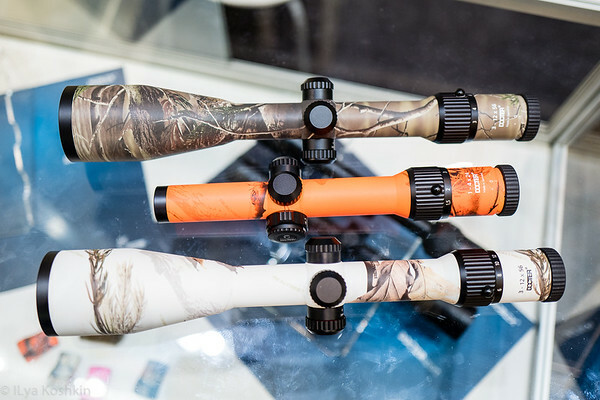 There are four riflescopes in the Vudu product line: 1-6×24, 2.5-10×44, 3.5-18×50 and 8-32×56. There are some discrepancies between the brochures I picked up at SHOT and the information on the website, but best I can tell, 1-6×24 and 2.5-10×44 are available as FFP models only, while 3.5-18×50 and 8-32×50 are available in both FFP and SFP configuration. The two reticles available in the 1-6×24 both built on the original circle-dot theme of the HWS. There is a 65 MOA circle that makes for a very quick CQB aiming point. However at 6x, it disappears outside the FOV and whatever is in the center of the reticle can be used for more precise shots. There you have an option of either a mil-scale or a horseshoe with caliber specific holdovers for either 5.56 or 7.62. 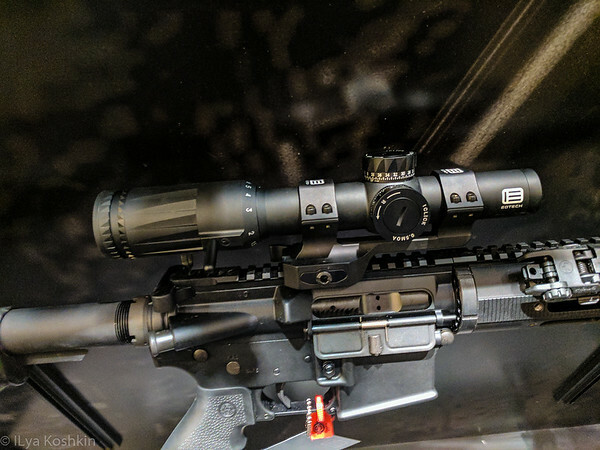 The reticles in the other scopes are fairly simple designs that look a little bit like Gen 2 MilDot (or Sig’s milling reticle) and are available in two versions: mrad-based and MOA-based. They look like perfectly respectable reticles, but I am surprised EOTech is not offering something along the lines of a Christmas tree or grid style reticle. I could have sworn I saw mention of H59 somewhere in the past, but I can’t find it anywhere now. Honestly, I think that is an oversight. I am curious to see how these scopes will do, so I sent an e-mail to the gentleman I talked to at SHOT to see if they are willing to lend me one to play with. The model I am most interested in is the 2.5-10×44. It is a very underlooked configuration and there are very few of these in FFP form. My plan is to compare it to US Optics B-10 1.8-10×42. Oddly enough an item that caused a lot of interest in the EOTech booth was the rifle that a couple of the scopes were mounted on. The rifle in question is called “The Fix” by Q LLC. Best I can tell, Q employs a bunch of people that used to work at Sig and AAC. I am not sure if either one of those companies has a financial interest in Q and do not particularly care. The rifles were interesting and, unlike most modern chassis-style rifles, quite light. I made a mental note to look them up and I did. And then I pre-ordered one. I like the idea of huting with the same gun I use for precision shooting and my Desert Tech is a bit too heavy for that. The Fix with a 16″ 308Win barrel weights right around 6lbs and takes a regualr LR-308 magazine that costs abotu $20. A Desert Tech Covert with a 16″ 308WIn barrel weighs around 10lbs and the magazines are $100 each. Desert Tech is probably a better precision platform. I like the bullpup configuration and its weight distribution, I like the quick change barrels. However, if I wanted to buy a Covert to add to me Gen 1 Desert Tech SRS, I’d be out around $5500. The Fix is $2800 and weights four pounds less. If it proves accurate enough for my needs, I’ll have to pull off some sort of a miracle of self-persuasion to keep my old SRS. Ultimately, that will become the question of how much I want to keep my 338LM. There were two fairly new things at Nightforce booth this year: ATACR F1 7-35×56 and SR-1 Competition 4.5×24 scope. Both were announced a bit before SHOT, but that was the first time I got to see them. The little 4.5×24 looked mighty appealing to me (I like compact fixed power scopes, probably owing to how much time I have spent with various Mosin PU scopes) until I figured out that it costs right around $1900. I will freely admit that it looks like a very well optimized scope and I am sure it will do well with service rifle competitors, but I am having a hard time justifying that cost for a fixed power scope. Then again, I am not a service rifle competitor, so I might be missing something. Also, it is cheaper than the March 1-4.5×24 that is also new this year. 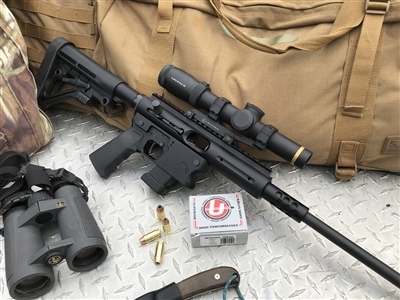 On the other side of the spectrum the FFP 7-35×56 ATACR is intended for a very different audience and I suspect it will do very well with precision rifle shooters. It is pretty expensive at right around $3500, but that is more or less in line with the competition, although in all fairness, if you want more than 30x in a FFP scope there isn’t that much competion out there. S&B 5-45×56 is close to $5k. March 5-40×56 is probably the closest and it costs about the same. 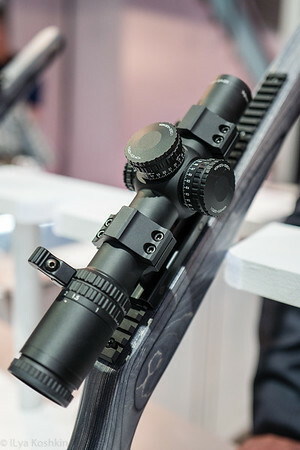 There were two 7-35x56s sitting in the Nightforce booth and one looked excellent while the other seemed a little iffy. I am guessing these were prototypes of some sort, but in the meantime I asked Nightforce to send me one of these for T&E. I really liked the 4-16×42 ATACR F1, so my expectations for the 7-35×56 are pretty high. I have not shot my 338LM in a little bit. This will be a good opportunity to do so. The big recent news with Trijicon is their acquisition of IR Hunter. That was a shrewd move on their part. In my opinon these are the best engineered of the commercially available thermal sights. Now, with Trijicon’s marketing muscle behind them, we will likely see them get a bit more traction. The first obvious effect though is that the price has gone up… Now, in principle, Trijicon has something to offer regardless of the type of a weapon sight you are looking for. Between RMR and MRO the have some of the better red dot sights on the market. ACOGs and Compact ACOGs continue to do well (although some could models stand a refresh). Accupoint and Accupower cover conventional riflescopes fairly well, while TARS serves the precision market (not sure how much impact it has had). On the non-thermal side of things there is a new version of the MRO called “patrol” or something along those lines, which is the original MRO with a different mount and some accessories. I really like the MRO and prefer it over the Aimpoint Micro, and the new mount is a solid improvement. THe top mounted control dial is much easier for me to use with either hand than most other arrangements. As far as small tubualr red dot sights go, I sorta settled on the MRO is being my overall favourite with Hi-Lux MM2 being the bang for the buck champ. There is also a new Accupower, and it is an interesting design being a FFP 1-8×28. A slightly larger than the more common 24mm objective might make a difference at 8x. Aside from that, it looks suspiciously similar to the 1-8×24 design that Light Optical Works from Japan makes for a bunch of other people. That is not a bad thing since this is a very respectable design, but I am not really sure what changes Trijicon has introduced other than a slight bump in objective diameter. The reticles are simple and fairly effective designs: broken circle and a ranging scale. There are two versions, one with mrad scale and another with MOA scale. I have mixed feelings about broken circle designs. They work adequately well, but a solid circle or a solid horseshoe is, I think a better option. One other nice feature thing is a removable cat tail. I asked Trijicon who I should talk to if I want to borrow one of these for T&E, and they gave me a business card for a gentleman named Eddie Stevenson who is the President of Driftwood Media. Apparently, that is Trijicon’s PR firm. I reached out to Eddie and got a fairly quick reply politely asking who I am. I told him what I do here and never heard back from him. He is either really busy, or he deemed that I am not worthy of testing the new Trijicon. I might still borrow one from one of my dealer/distributor friends, but that sorta depends on how busy I am in this coming year. In years past, I tried to get my hands on every new scope in some manner, but that was before I was married and with kids. Nowadays, I follow the path of least resistance: I figure out what I want to compare, reach out to the makers and spend whatever time I have on the actual testing process. If I have to spend time chasing after a manufacturer or, in this case, a PR firm, that’s basically a non-starter for me. Most of the time, that means they will not deal with writers whose opinion they can not easily influence (via advertising revenue or other means), and I do not feel like delving into figuring this out. I had never heard of Juggernaut Tactical before, although they, like me, live behind enemy lines (in California) and have to comply with California insane laws. They make a lot of miscellaneous parts for semiauto rifles including a bullpup chassis for M1A and a bunch of other things. What attracted my interest was there CA-compliant AR stock. It replaces the buffer tube and provides a pretty good way to make a “featureless” CA-compliant AR-15 or LR-308. Interestingly, the part of the buttstock that replaces the buffer tube is apparently three times thicker and it feels exceptionally sturdy. They also tell me, it gets rif of that annoying twang sound AR buffer tubes make. It comes with an extended takedown pin that serves as a thumb rest and still allows yo to use your original pistol grip (except you cant wrap you thumb around it). The length of pull was about right for me, and I think it will serve well on my LR-308 when it finally comes out. I always stop by the Kel-tec booth to see what they have that is new. They are an innovative company that really needs more manufacturing capacity. What has a really got my interest lately with Kel-tec is their RDB-C rifle. It is a semi-automatic bullpup rifle that does not have a pistol grip. What it does have is a very respectable trigger. Since there is no pistol grip, it should be allowed in the People’s Republic of Kalifornia. It was surprisingly comfortable to hold and when equipped with a 20″ barrel, the overall length is just over 30″. If they actually make it, they will have the bulk of the California market to themselves. They have a 5.56 variant and they are working on a 6.5Grendel one. I will buy both when available. I’ve always had a somewhat complicated relationship with US Optics. I like a lot about this company, but for a little bit I thought that the market has sorta passed them buy. They did not have a whole lot of new development (they did have some with low range variables) and while I am a big fan of the EREK knob, I do not like the low magnification tunneling and I did not like how much their scopes cost. This year, they’ve got the new B-series scopes which are newer iterations of the original 1.8-10x, 3.2x-17 and 5-25 designs called B-10, B-17 and B-25 respectively. They told me that there were some changes in the system that helped with the tunneling and the turret box was redesigned a bit to be more streamlined. The tunneling is still there, but looks less pronounced. The elevation turret is still excellent, and, very importantly, the pricing is a bit more reasonable, at least for the B-10 which lists somewhere around $1700. B-17 and B-25 list at $2300 and $3300 respectively. B-10 is the one that I would like to look at. It is reasonably compact and I really want to give the new turrets a workout with the new zero stop design, tool-less zero, etc. I glanced at their website and it looks like they are still making changes to it. At the moment they’ve got some rather questionable product categories there, but I will reserve judgement until it is all updated. This is a British company I stumbled onto purely by accident. Apparently, they make Jpoint and have, in the past made a bunch of miniature reflex sights for others, like Trijicon. They are now marketing their sights under their own brand and best I can tell, they have been in use by British military for quite some time. There is a rumor floating around that their rifle sight (either SQS or SIS, I guess) proved to be more reliable than Aimpoint Micro in some British trials. If true, that is pretty impressive. Aimpoint Micro is a nice sight. Shield currently has for reflex sights in their product line. The original miniature reflex sight is called SMS (Shield Mini Sight) is what you get if you order a Jpoint and a few other sights. Best I can tell, this is the only one that Shield OEMs for others. The other models are RMS (Reflex Mini Sight), CQS (Close Quarter Sportsight) and SIS (Switchable Interface Sight). The SIS feature list, interestingly, enough, looks like someone reached into my notes and made a carbine/backup sight based on them: it has three auto adjust modes and a manual adjust mode, it has four reticles you can switch between (8MOA dot, 4MOA dot, 1MOA dot with a 65MOA ring made out of 12 dots, and SIS 2MOA bullet drop). It also looks pretty indestructible and very compact. 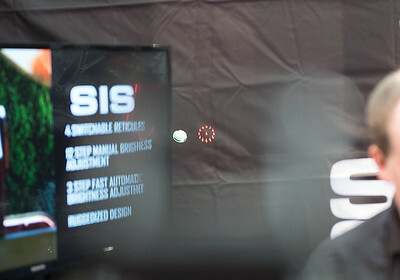 The SIS 2MOA bullet drop reticle is unique to the SIS, while the other four reticle are available in the other sights as well. CQS looks pretty similar to the SIS, so I am assuming it is the earlier version. That is the sight that is in service with the British military. Like the SIS and RMS, it has an aluminum body (earlier SMS has a plastic body). You lose some of the options you have with the SIS and save about a hundred bucks. I think SIS runs ~$500 and CQS runs around $400, so they are up against some pretty serious competition, and I am very curious to see how they stack up. 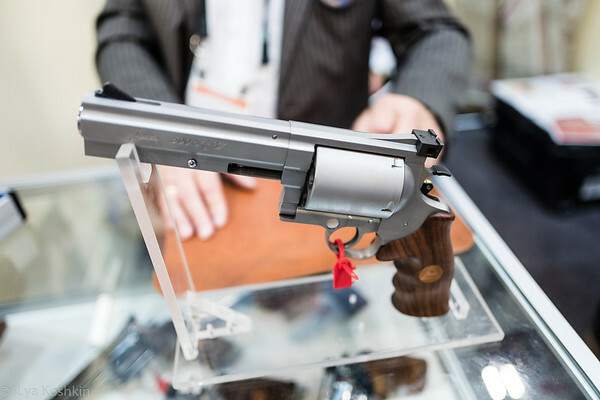 For handguns, the sight that really got my attention is the RMS. It has the lowest base of any red dot I have seen and looks like it would be a perfect match for cowitnessing iron sights. With the proprietary plate, it cowitnesses with standard Glock sights, which is kinda remarkable. Basically, the body of the sight below the lens is concealed by the rear sight and does not interfere with the sight picture. That means that all the presentation drills I do with iron sights are not wasted. With RMS, I do not have to change a thing. I sent the gentleman who owns Shield an e-mail to see if I can get my hands on one. We will see how it goes, but I am pretty pumped about these. Another British company around the corner from Shield was Nite-Eyes. I was probably pre-dispositioned to not take them very seriously since I have a pet peeve about intentionally misspelling words. I am not sure what the reasoning is behind butchering the words “Night” and “Sight”. Maybe they were trying to write in ebonics or something. I was not born in this country and I worked very hard to learn this language. I sorta take it personally when people butcher it for no good reason. 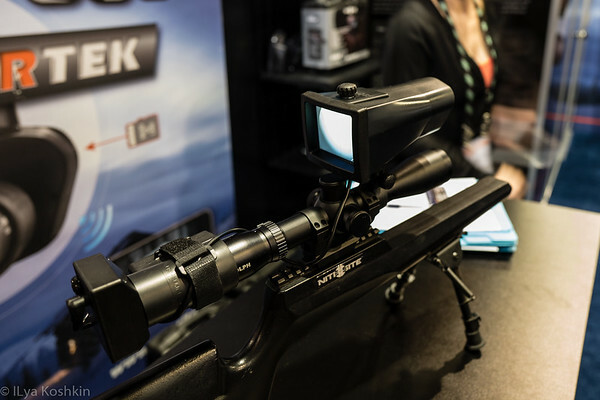 This company makes a Near InfraRed camera that clamps onto your scope and blasts the image from the eyepiece onto a screen that hangs a few inches above the scope. 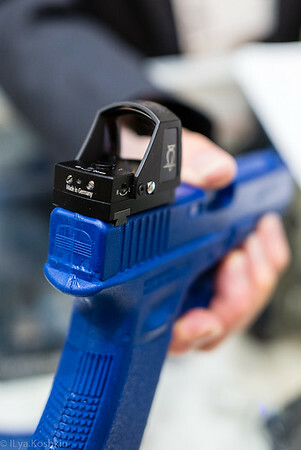 The gizmo with the screen also contains a NIR illuminator that points in the same direction as the barrel. I see a few problems with this approach. First of all, if you are shooting a rifle with any sort of recoil, that camera will smack you in the face. Looking up at that screen while shooting is very unnatural and breaks your cheekweld, since looking at the screen without breaking your cheekweld did not work for me due to camera housing blocking the line of sight. Then again, they had it all set up with on a Rudolph scope, which kinda stands to reason… On a plus side, the had a standalone system that was essentially a NIR spotter: it integrates a NIR camera and illuminator into one module with a screen on the back. That seems like a perfectly viable idea except for some ergonomic issues. They claim that it is designed to spot things out to several hundred yards which requires some means of holding it in a stable manner. The way it is right now is not conducive to that. Still, that is a fairly clever gadget, while their system that attaches to a scope is… well, I think you worked out what I think about it. Sightron did not have too many new things this time around. They now offer simple plex reticles in some of their high magnification scopes. There is a new small rimfire scope in the SIH line (3-9×32) which looks like a pretty nice little scope, but a simple crosshair reticle it comes with is not my cup of tea. I think there were a couple of new SII Blue Sky spotters as well. 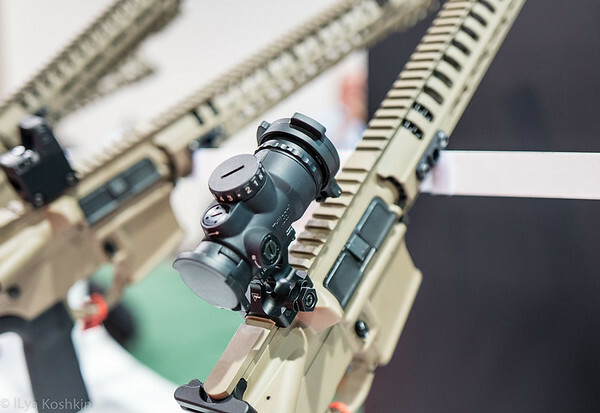 The two announcements that are of interest to me were in two far removed from each other market segments: miniature red dots sights and ultra high magnification target scopes. 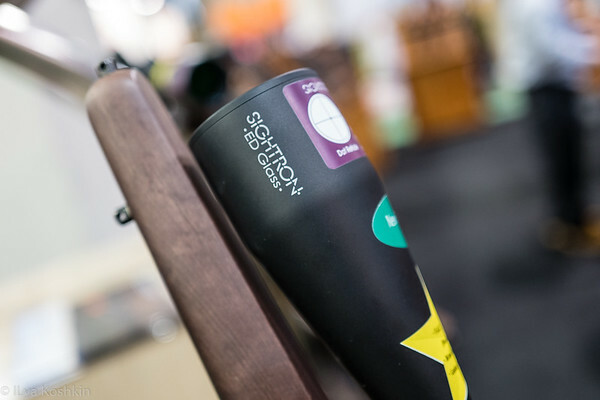 I spent a lot of time with Sightron’s SV 10-50×60 target scope and really liked the innovative dual speed side focus. That scope was almost good enough to go head to head with the Marches of this world, but did have some annoying CA at high magnification. More importantly, Vortex’ new Golden Eagle cost a bit less and performs better at high mag. Now, Sightron has updated this scope with ED glass, which should help at high mag. It should be out in late spring some time and I will make sure I get my hands on it. 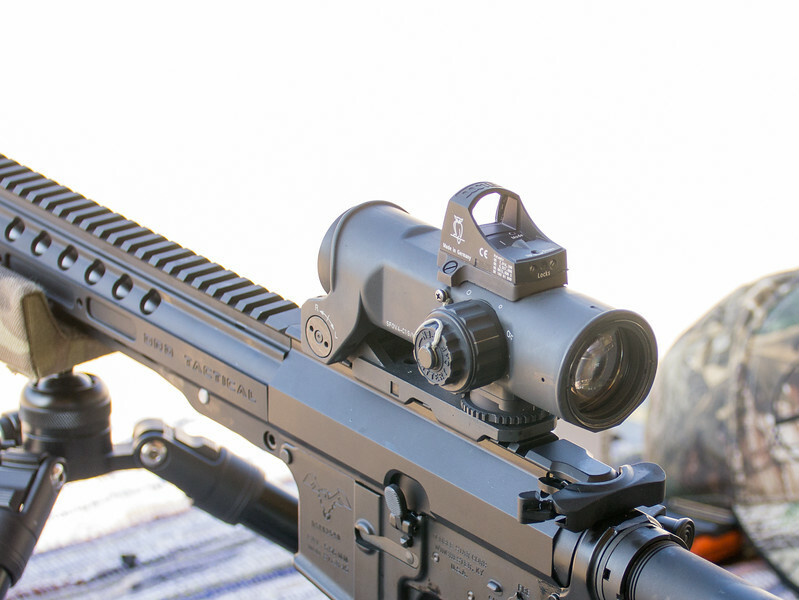 On the opposite side of the spectrum, it looks like Sightron is finally getting into the miniature red dot sight business with their new SRS6 that features a 6MOA dot and a battery compartment accessible form the top. I’ll make sure I look at that one too. While I work on the pictures and some written commentary, here are the video clips of my ramblings after SHOT. I apologize about how disorganized these are, but they are mostly intended as a means for me to record my impressions before they fade. I finally managed to get a couple of hundred rounds through it and since it is still about as reliable as a politician’s promise, I sent TNW’s tech support an e-mail. I recently purchased an ASR from you chambered in 10mm. I fired of a couple of hundred rounds as a break-in of sorts, but the situation is not improving, so I figured I should contact you and see if you have any suggestions. The rifle is not very good in getting a round into the chamber. On an initial round, where I manually cycle the bolt (I pull it all the way back and let it go), the round does not go into the chamber. It looks like the nose of the bullet hits the fed ramp and bounces up, Instead of going into the chamber, the round is stuck pointing upwards. Once I get a round chambered (by manually inserting it into the chamber and closing the bolt on top), the rifle fires and the next round is successfully chambered about eighty percent of the time. The rest of the time, there is the same failure to feed and I have to start over with the manual chambering. About fifty rounds ago, the rifle stopped firing altogether. When I took the bolt out of the receiver, I noticed that the firing pin is frozen in place. I carefully tapped it out and discovered that the back of the bolt is all chewed up from the impact of the hammer. It is apparently so soft that it deformed into the firing pin channel and prevented it from moving. I gently removed the deformation and chamfered the back opening of the firing pin channel. That got the firing pin working again, but I am a little concerned that if I continue using the rifle, it will get deformed again. Honestly, it sounds like the heat treat on the bolt is not quite right. I would not expect it to be that soft. I’ll let you know if they come up with anything good. So far, I am more than a little disappointed. ASR stands for “Aero Survivial Rifle”. In principle, it would be a good survival rifle, since it can be taken down and transported in a very compact bag. I like survival guns and have reasonable familiarity with several of them. They are often crude, but decently reliable. To trust a gun to be a survival tool, you have to have faith in it. At this stage in the game, I have about as much faith in the ASR as I do in the ethics of news reporters’. At this stage, if I can get the reliability issue worked out, it will take a fair amount of reliable operation to restore my faith. Until then, this is a rather expensive project gun that I have to tinker with. In principle, I suspect that polishing the feed ramp with some JB paste might do the trick, but I will wait for TNW’s response prior to doing that. I have been looking into various miniature red dot sights for quite some time. I typically use them as auxilliary sights to the primary magnified optics, but I did put together an article focused on a couple of specimens: Leupold Deltapoint and Vortex Razor (here). I liked both of them pretty well, but they also had a few shortcomings. Also, I realized that the type of shooting I typically do is not conducive to giving red dot sights a fair shake. I am a precision guy at heart, and that is not what these sights are designed for. That did not mean that I stopped looking at reflex sights, but I did start expanding my shooting practice into other disciplines and, a couple of weeks ago, I finally made it out to Frontsight for a rifle class. This class had a very brief stint shooting from 200 yards, but the bulk of the shooting was from closer distances, mostly within 50 yards, which is red dot territory by and large. On top of that, I suffered a leg injury early in the class, so I had to shoot standing from all distances even when other positions were available. Trying to get into any other shooting position was painful. Even though I had both a magnified sight and a red dot on my rifle, I ended up using a red dot a lot more than I originally thought. For me a rifle class is both a training opportunity (especially since shooting offhand is easily my weakest discipline) and an opportunity to test different optics. I went there with my brother and my nephew and since I had three rifles to set up, I had a chance to look at several sighting systems. I will talk about most of these other sights in separate pieces, but I will mention them here and there. In principle, the DocterSight competes directly against the Meosight and they look very similar, to the point that they even use the same mounts. However, there are a couple of important differences in how they operate. DocterSight does not really have any external controls per se. Once the cover is off, it senses ambient light level and adjusts the dot brightness accordingly. Generally, that is a pretty good way to go, except for one problem: if you are in a shaded place, but your target is brightly illuminated, the dot might not be bright enough. To be honest, that is how this whole idea of looking at the DocterSight III started. 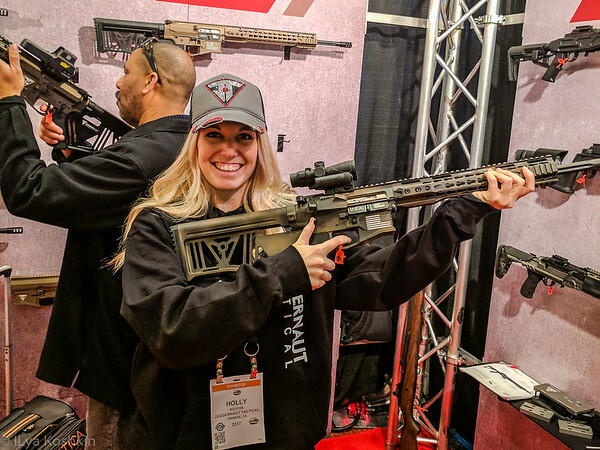 I was roaming around SHOT Show earlier this year and upon stumbling onto the Docter booth, I blurted out something along the lines of: “nice sights, but I’ve got some issues with the operating method”. Going forward, I think I will try to first see what is new in the booth before voicing opinions, since the very pleasant lady at the Docter booth, instead of telling me to shove my opinions where the sun don’t shine, cheerily suggested that I looked at their latest iteration of a reflex sight, namely the DocterSight III. Basically, I had to eat some crow. It is not my favourite thing to do, but that is what I get for talking too much. I was pretty busy earlier in the year, but in late summer I reached out to Docter and asked for a sample of DocterSight III that I can take with me to the rifle class. The first thing I did, was try to throw different lighting conditions at the DocterSight III to test all these operating modes and it passed that first test with flying colors. Then, I mounted it on my rifle and headed to the range. 2) if you do this, you really get an idea of where your zero is. Basing it on an aggregate of twenty shots is much more trustworthy than on three. I had to make one small adjustment after that and we were off to the races, so to speak. After that, I spent a fair amount of time setting up other rifles and did not shoot with the DocterSight a whole lot until we headed off to FrontSight. I did shoot it side by side with the Meopta MeoSight III a fair bit, and one interesting thing that came up was that the dot on the Docter optic had sharper edges. The MeoSight seemed to have a bit more of a starburst effect to my eyes. Now, I have a slight astigmatism, so the dot is not perfectly round to me, but with the DocterSight, in slow fire, I could use the edge of the dot for aiming. With the other red dot sights I had, I could not do that as easily. Frankly, I have not spent too much time digging into that so far, but I will. Generally, that blooming effect is usually due to the dot being too bright, but with MeoSight I was running in the manual mode (it has both a manual mode and an Autoadjust mode), so I tried to decrease dot brightness. The dot was still sharper on the Docter. Weirdly, the dot in the Leupold LCO and Vortex Sparc AR was also less well defined than in the Docter. During the class, all reflex sights I had functioned without issues, but I had the most time with the Doctersight and it worked beautifully. I had some initial concerns that the speed of finding the dot might be a problem due to the sight sitting above the primary sight, but those concerns turned out to be unfounded. The 3.5 MOA dot size turned out to be just right for my purposes. I generally like smaller dots and I think the 7 MOA is better suited for handguns, while the 3.5 MOA was just right on a rifle. Despite some fairly rough handling the sight stayed zeroed and never gave me a hint of trouble. I am not sure what the battery life will be, but so far I have not had to change it. I’ll keep using it and see how long it lasts. In order to change the battery, I have to remove the sight from the mounting plate, so one of the things I want to keep track of is whether that causes a significant POI change. 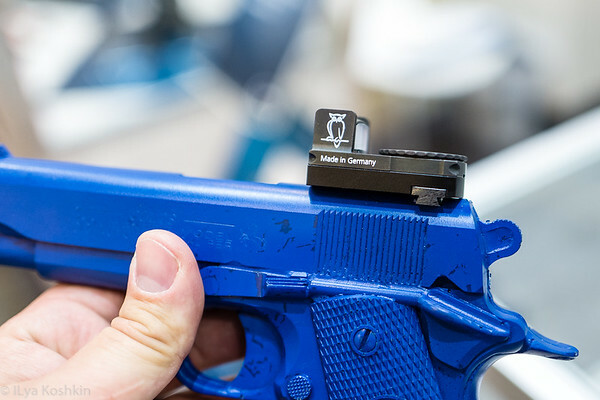 Interestingly, some competing designs, like the Razor and Meosight, have a sidemounted tray that holds the battery, while some others, like the Deltapoint Pro and FastFire access the battery from the top. I am a bit mixed on what is the better way, so it will take some experimentation. I suspect that accessing the battery from the bottom aids reliability and compactness. With the side mounted battery, keeping the contacts always connected might be more of a challenge, although I have not run into these issues. 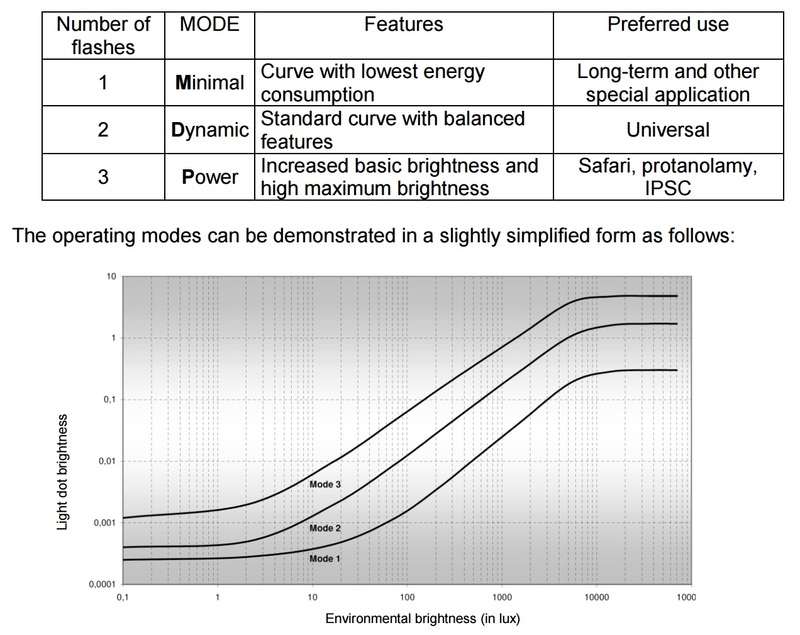 Top acces battery is likely to require a larger sight body and might interfere with LED placement. Either way, that is one of the things I plan to investigate going forward. Fundamentally, I like this sight a fair bit and, honestly, more than I thought I would. I will keep it on my AR for now. At a later point, I might try it on my Glock. As I wrap up with my testing, I’ll put together some final thoughts and, naturally, if I run into issues, I will report those as well. For now, I am pretty impressed with what I see. 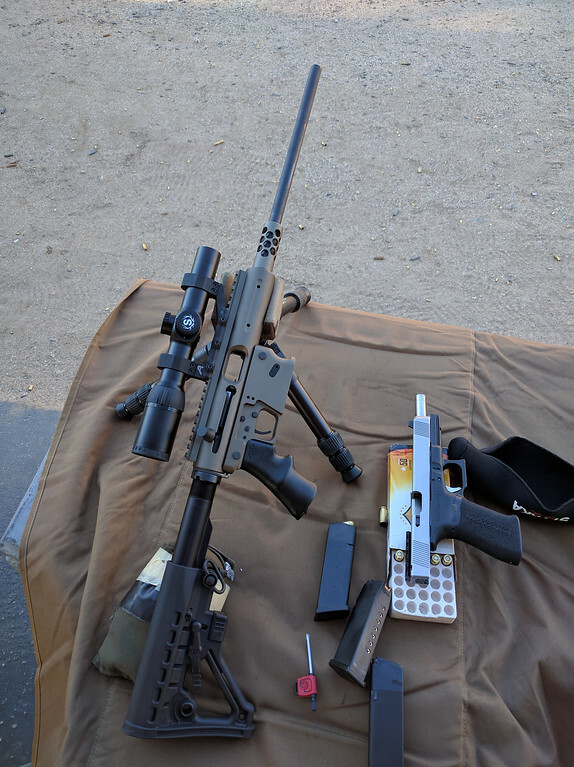 I finally managed to get my hands on one in 10mm and dragged it out to the range together with my longslide Glock that takes the same magazines. I really like the concept of this carbine: it is easy to take down and it is very handy. Also, a 10mm cartridge out of a 16mm barrel is a pretty potent beast. Now, I understand that firearms need some break in, so I am not going to form any major conclusions yet. However, of the three ammo types I brought with me, it only fed with one: 180gr FMJ Armscor. I had two Double Tap loads with me, 135gr HP and 230gr Hardcast and neither would feed. 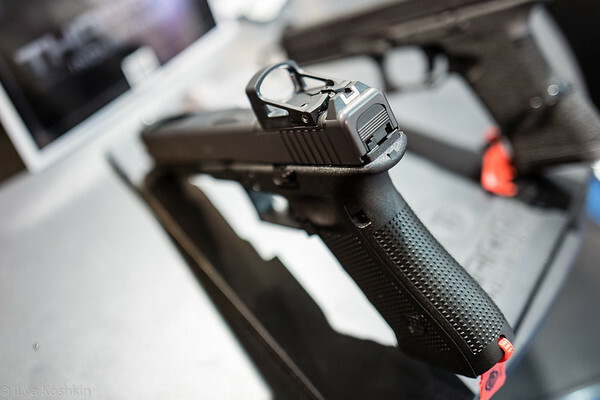 The trigger is quite possibly the worst I have tried on any modern firearm and the grip it comes with must have been selected specifically to be so uncomfortable that I do not pay too much attention to the trigger. Once I got a round in the chamber and muscled my way through the trigger, the gun went boom every time and ejected a spent case every time. I chrono’ed the velocities and they were within expectation. I will take it apart and take a close look at what is happening inside. I can see where the cartridges are getting hung up and causing failures to feed, so perhaps I will need to do some minor surgery to that spot. That will wait a bit though since I will first get a couple of hundreds of rounds through it as a break-in process of sorts. If it still gives me issues, I will give TNW a call and see what they say about it. I want to learn to shoot out to 1000 yards…. Many people much more qualified than I am have written on this subject, so there is a lot of material out there. To top it off, I am not that great of a shot. I do know a fair bit about gear and I am definitely up to speed on just about all the new developments in the riflescope world. Unfortunately, with the internet being what it is, so is everyone else. Not enough information is a bad thing. Too much information is a bad thing as well. There is a nearly uncountable number of different set-ups (rifle/caliber/optics combinations) that will get you to 1000 yards. The thing that will hold you back the most is your skillset (ask me how I know…). Developing the skills to shoot long distance consistently is difficult, timetaking and expensive. It requires a lot of practice. As you go through this exercise and this practice you will figure out what kind of gear works well for you. With that in mind, what I want to do here is make recommendations on what you should start with. It will take you to 1000 yards and if it is a good fit for you, it will serve you well for a long time. However, chances are you will change something along the way. All I want to do is suggest some equipment that will not hold you back as you learn. If you are just starting out, looking at the best shooters in the world are using and copying that is not necessarily your best option. Their requirements are not the same as yours. First, let’s talk about caliber. I still keep on hearing people say: “just get a 308! There are so many loads for it!” That will work, but I think that makes things complicated. If you reload, it almost makes no difference which caliber you get as long as there is a good quality brass for it. If you do not reload, match quality 308 ammo is not cheaper than some others. Generally, if you do not reload, stick with 6.5 Creedmoor. That is the least expensive high quality ammo out there. Match 6.5 Creedmoor ammo is actually cheaper than Match 308Win ammo most of the time. Generally, various 6.5s are a good way to go: 6.5Creedmoor, 6.5×47 Lapua, 260Rem, etc. If you reload, any of these will work. If you do not reload, go with 6.5Creedmoor. At the moment, these calibers offer the best combination, flat trajectory, low recoil and barrel life out there. Yes, some 6mm calibers have flatter trajectories and lower recoil at the expense of barrel life. Some magnums have exceptionally flat trajectories, but they beat you up with recoil and burn barrels. Pick a caliber with decent barrel life, low recoil and external ballistics that let it stay supersonic to at least 1200 yards. Rifles: the simplest is to get a Ruger RPR. If you prefer a more traditional stock, get a Savage 12 Long Range Precision in 6.5Creedmoor with a 26″ barrel or a Tikka T3x CTR with a 20″ barrel. If you want this rifle to do double duty as a hunting rifle, get the Tikka since it is the lightest. Otherwise, it is all the same. 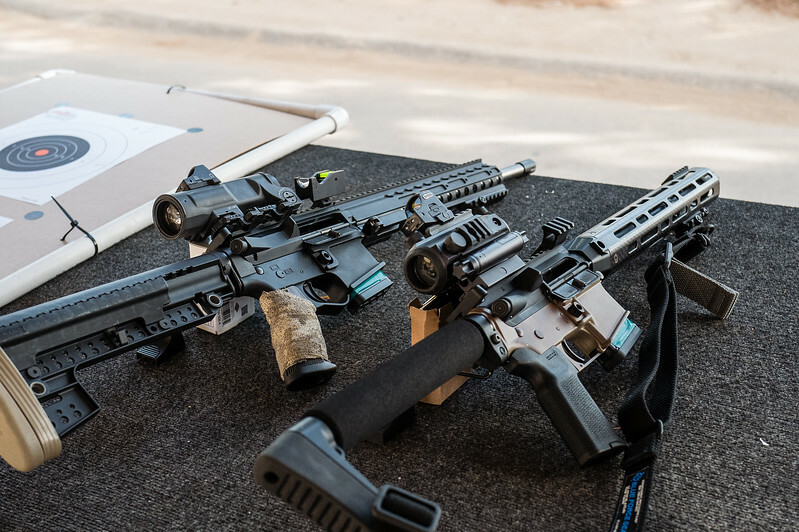 Yes, there are other rifles out there that will do the job, but in my opinion these three will do so with the least amount of fuss right out of the box and on budget. If you can afford it, you can always get a fancier rifle, of course. Optics: Virtually every competitive shooter out there is running a 5-25×56 or 6-24×56 or something along those lines, so I might get a lot of flack for suggesting you do not go that route. Not in the beginning. Learn to shoot with your scope at 10x or 12x. It is very difficult to develop the right skills if you reticle is jumping all over the place, which is exactly what will happen if you set your scope to 25x. The best starter scope configuration is a good quality variable of approximately 3-15x or 3-18x or similar configuration. Use the highest magnification to read the conditions. Then do most of your shooting at lower magnifications. If you decide to learn to shoot from non prone positions as well, that 3x on the low end will come in pretty handy. Aside from magnification, here is what I recommend you do: make sure the scope has a FFP reticle. Yes this can all be done with a SFP reticle, but that complicates things. Make sure the scope has turrets that track. Zerostop is a good thing to have, although it is not a necessity. Christmas tree style reticle is a good thing to have, but I suggest you first learn to do this with turrets. Later you can decide if you want to primarily use the reticle for your holds, but starting with dialing is a good practice. It instills discipline. Make sure the reticle and the turrets match, i.e. both are in mrad or both are in MOA. I strongly prefer mrad, but that is a personal preference. Make sure that the scope has the means to correct for parallax. If you are on a severe budget, get a SWFA SS 10×42 with Mil-Quad reticle for $300 will get you going. If you can afford to spend $700, stick with SWFA 3-15×42 FFP. $3k or more: Tangent Theta TT315M I just got done testing one. Overall, this is the best scope I have ever used. Make sure you get high quality mounts. As we get closer to the presidential election my various politician induced paranoias bubble up to the surface and make me think about survival guns. Now, I do not think that the end of the world is coming just, but anything that gives me an excuse to get another gun is fine with me. 10mm is a pretty potent round and a 6″ barrel gives it a notable energy and speed improvement over shorter barrels. 10mm is a new caliber for me, so I figured I should research its ballistics a bit more. As a part of that researched I stumbled onto the fact that some of the peppier 10mm ammo achieves really impressive speeds from longer barrels. I had looked at getting a pistol caliber carbine in the past, but at the time I mostly looked at 9mm and 45ACP versions and they do not offer enough of an advantage in energy for me to mess with, They are definitely easier to shoot accurately and they do go faster, but it always seemed like higher pressure rounds make more sense in a carbine like that. I had considered getting a 357Mag levergun, but since Remington bought and ruined Marlin, that became an iffy proposition. I had looked into 357 Sig carbines, but the only viable offering I saw was getting a Mechtechsys conversion for my Glock frame, which is an interesting solution, but it is not as compact as I want. Also, since I live in California, I would have to mutilate mag release on a perfectly good Glock to make it legal (look up “bullet button” if California gun law perversions are new to you). I let it go at that, but now I stumbled onto a company called TNW Firearms. 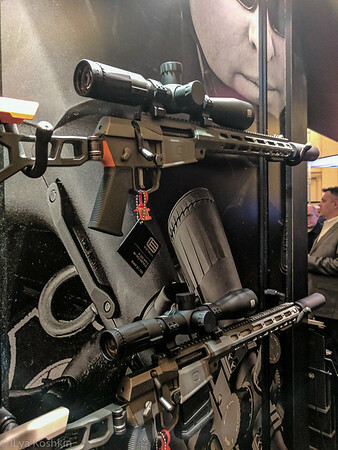 They make a switch barrel pistol caliber carbine called Aircraft Survival Rifle (ASR) that can be configured for both 357Sig and 10mm (and other calibers). On top of that, they chrono’ed the velocity of some of the peppier ammo from Underwood and Buffalo Bore among others out of their 16″ barrels. If these numbers are true, this is exactly what I was looking for: 357 Sig carbine, 10mm carbine. I did a little more digging and I am pretty impressed with what I see. The basic weapon design is clever and a few minutes of web surfing yielded a number of positive reviews. The trigger is reputed to be decent as well. After some consideration, I think I will get a 10mm version of the carbine and test it thoroughly. Now, considering what my interests are, I started giving some thought to the best sighting system for such a carbine. It comes from the factory with some sort of an inexpensive 4x scope. If it is the design I am thinking of, I fully intend to chuck it into the trash bin as soon as it gets here (well, I suppose I’ll look at it briefly to be certain). Since this is ostensibly a survival tool, I would like to set it up with a dual sighting system: that gives me both unity magnification and some sort of a 2x to 4x magnification for a bit more precision. That means either a low range variable, or a combination of simple iron sights with a compact fixed power scope or red dot with a magnifier (or a red dot and magnified scope in QD mounts pre-sighted in). Once I get my hands on the carbine, I will do some experimentation and see what works best. The trick is to keep the whole sighting arrangement sufficiently compact and light weight to make sure it does not upset the balance of the carbine. Also, since the rail is fairly short, I need to give some thought to what kind of iron sight arrangement will work best. Most AR sights are designed with a longer sight radius in mind, so I do not know how well they will work on the ASR. Most red dot sights with magnifiers are probably too heavy, which raises another concern. It is the same concern for most quality low range variable scopes. Anyhow, this will be an interesting challenge.